substantially across districts and at key career milestones—when teachers complete pre-service teacher education, become initially licensed, are considered for tenure, and receive a professional license. A comprehensive system should address these purposes in a coherent way and provide support for supervision and professional learning, identify teachers who need additional assistance and—in some cases—a change of career, and recognize expert teachers who can contribute to the learning of their peers. 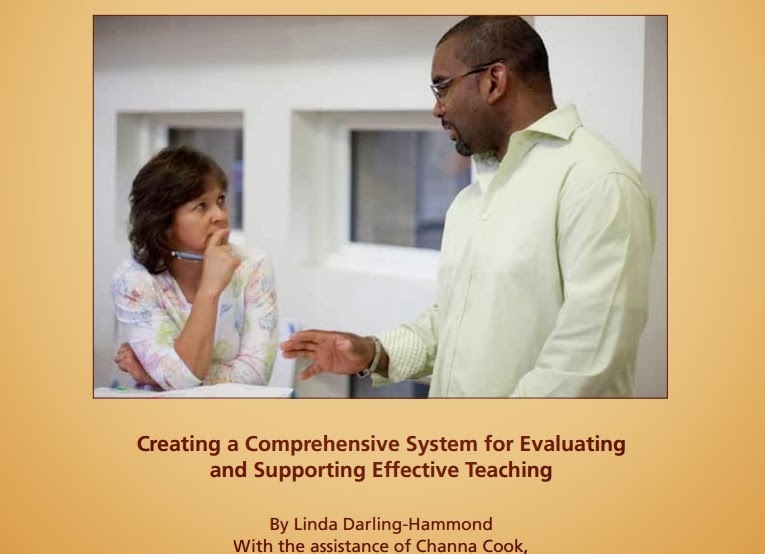 This report outlines an integrated approach that connects these goals to a teaching-career continuum and a professional development system that supports effectiveness for all teachers at every stage of their careers. In the context of the current interest in measuring teacher effectiveness, it is important to dis- tinguish between teacher quality and teaching quality. Teacher quality might be thought of as the bundle of personal traits, skills, and understandings an individual brings to teaching, including dispositions to behave in certain ways. Teaching quality refers to strong instruction that enables a wide range of students to learn. Teaching quality is in part a function of teacher quality— teachers’ knowledge, skills, and dispositions—but it is also strongly influenced by the context of instruction: the curriculum and assessment system; the “fit” between teachers’ qualifications and what they are asked to teach; and teaching conditions, such as time, class size, facilities, and materials. If teaching is to be effective, policymakers must address the teaching and learning environment as well as the capacity of individual teachers. 1. Common statewide standards for teaching that are related to meaningful student learn- ing and are shared across the profession: Standards for student learning can focus teachers’ work and learning. They also permit aligned standards for teaching, like those created by the National Board for Professional Teaching Standards (NBPTS), for accomplished veteran teachers, and the Interstate New Teacher Assessment and Support Consortium (INTASC), for beginning teachers. These should guide preparation, licensing, on-the-job evaluation, and ongoing professional learning. 2. Performance assessments, based on statewide standards, guiding state functions such as teacher preparation, licensure, and advanced certification: Well-designed performance-based assessments, like those created by NBPTS and states like Connecticut and California, have been found both to predict and develop greater effectiveness. Such assessments—which look directly at teachers’ abilities to plan, teach, and assess learning—should be used to make key decisions regarding entry into the profession, readiness to be professionally licensed, and recognition of expertise. In a tiered system, these kinds of assessments can create a career continuum that fosters career development from early preparation to instructional leadership. • Standards-based evaluations of practice based on observations, curriculum plans, assignments, and assessments revealing teachers’ classroom practice. • Evidence of teachers’ contributions to the work of their colleagues and the school as a whole. Since student learning gains are a function of teachers’ collective efforts, these valuable contributions should be part of the evaluation process. • Evidence of teacher’s contributions to student learning based on multiple sources of information reflecting classroom work and other assessments that are appropriate and valid for the curriculum and for the students being taught. 5. Aligned professional learning opportunities that support the improvement of teachers and teaching quality: These should link both formal professional development and job-embed- ded learning opportunities to the evaluation system. Evaluations should trigger continuous goal-setting for areas teachers want to work on, high-quality professional development sup- ports and coaching, and opportunities to share expertise. To transform systems, incentives should be structured to promote collaboration and knowledge sharing, rather than competition, across organizations. Knowledge-sharing is needed to develop not only learning organizations but a learning-oriented system of education in which ongoing evaluation and inquiry into practice are stimulated within and across classrooms, across schools partnered within regions, and within the system as a whole. 1. Value-Added Models of Teacher Effectiveness Are Highly Unstable: Teachers’ ratings differ substantially from class to class and from year to year, as well as from one test to the next. 2. Teachers’ Value-Added Ratings Are Significantly Affected by Differences in the Students Assigned to Them: Even when models try to control for prior achievement and student demographic variables, teachers are advantaged or disadvantaged based on the students they teach. In particular, teachers with large numbers of new English learners and students with special needs have been found to show lower gains than the same teachers when they are teaching other students. Students who teach low-income students are disadvantaged by the summer learning loss their children experi- ence between spring-to-spring tests. 3. Value-Added Ratings Cannot Disentangle the Many Influences on Student Progress: –––Many other home, school, and student factors influence student learning gains, and these matter more than the individual teacher in explaining changes in scores. The limitations of value-added analysis do not mean that districts cannot include evidence of student learning in the evaluation process. Some districts use a variety of other measures of student learning in evaluations of teaching, such as evidence drawn from classroom assessments and documentation like the Developmental Reading Assessment; pre- and post-test measures of student learning in specific courses or curriculum areas (developed by individual teachers, departments, school faculty, or district faculty or staff); evidence of student accomplishments in relation to teaching activities, such as student science investigations, research papers, or art projects. Some districts use evidence from teachers’ careful documentation of the learning of a set of diverse students over time, like that included in NBPTS portfolios. The key is that the assessments be appropriate for the curriculum and the students being taught. This may mean the use of tailored assessments for certain students—such as English language proficiency tests for gauging the progress of new English learners—and the consider- ation of learning evidence in light of the teaching context.